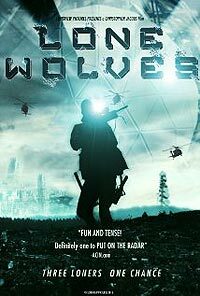 Lone Wolves (2015) - Sci-fi-central.com. Australia  2015  87m   Directed by: Chris Jacobs.  Starring: Dan Purdey, Warren Otteraa, Alana Tranter, David Leeming.  Music by: Chris Jacobs. After the apocalypse, Private James Conroy is living in an abandoned shack at the base of a radio tower. When Conroy finally contacts Garry Freeman, marooned in a space station, they have to learn to work together if they're going to save themselves, and maybe all of civilization. A little girl playing with a slinky causes an apocalypse with mutant creatures. Within a few minutes only Pvt. James Conroy (Warren Otteraa) and Australian astronaut Garry Freeman (David Leeming) are left alive and later we find out Elizabeth (Alana Tranter) is alive too. For much of the film they chat, put colanders on a stick, and kill mutants with CG fire with a quadruple barreled pistol. First off, if I was they only military man alive on earth, I would make myself a general. The acting was comical. In one scene James is running and killing mutants. Due to the budget all we see his his face making growls and the scope of the gun. Our astronaut is in a space station that has the same gravity on earth. No explanation required as "the space station set was built in the backyard shed of the Directors house he was renting." There were many scenes where a person was talking and the sound track muted out what they were saying, something they could have fixed in post had they bothered to screen the product before putting it out to market. The whole film was sloppy. Several scenes were "so bad it is good" especially the fighting scenes and system warning labels. This is Christopher Jacobs first attempt at writing, directing, and producing.